TL;DR: We are more than just another Yahoo Answers or forum, but we are presenting ourselves in exactly the same way; just another Q&A site. Although technically correct, due to our rules and organization we're a lot more than that. Right now it's possible to find answers to most, if not all, beginner questions on SO. We've have become one of the best, if not the best, programmer's resource and the same is true for some of the other network sites. The problem is that by giving the 'Ask Question'-flow dominant care and placement we're actually motivating new users to ask their questions rather than search for answers. This is a direct consequence of the structure and setup of the site, not of "lazy newcomers" or "help vampires" and can be solved by giving the search flow far more dominant placement and care (see mockups below) specifically for very low rep and guest users. I have read through various discussions regarding the problem of "help vampires", users that simply ask questions, doing nearly no troubleshooting of their own and not contributing back to the community. Although I do not believe they are that big of a problem on their own, I do agree that it's a bit sad how right now 3 out of 4 questions I see on the homepage that are asked by users with rep under 50 are answerable using a simple Google search limited to StackOverflow questions (and the fourth could be answered by combining two other questions). We already have the content, and yet we spend a lot of time and effort closing and answering the same questions over and over and over again. 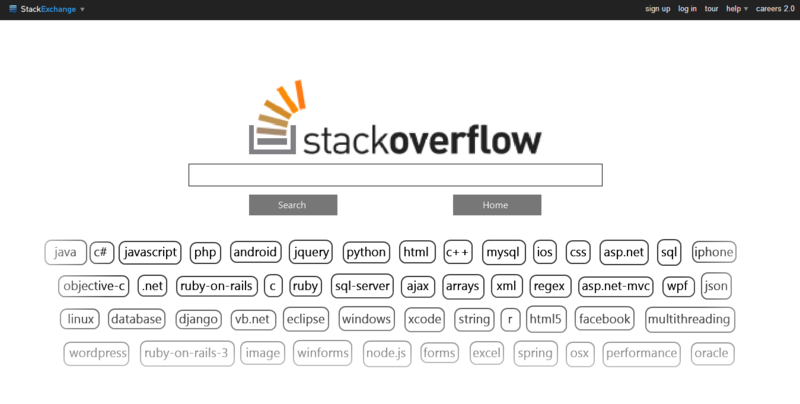 Now, rather than just complaining I was thinking how one could possibly solve this issue and one thing that hit me is to make the Stack Overflow homepage a true search homepage with the search box up front and centre for very low rep (<15 or so) and new users. Additionally it would also be good to give the search bar a more dominant placing on the question pages, once again primarily or only for low rep or guest users. This would come along with hiding user interface elements such as 'Ask Question', 'Top Questions', 'Users', 'Badges', 'Unanswered' and maybe even the 'Hot Network Questions'. And only on the search results page or the Q&A homepage would the option be shown to ask your question. In previous versions of this question I wrote that I could not think of any situations where one could wish to ask a question as a new user without first searching. The interesting point has been made by Cerbrus that a user who has searched previously and then comes back to the site will have searched already and knows the answer is not on the site. A possible solution could be to show the button based on previous search habits which could be stored client side without an account. Now, personally I think the link to the Q&A homepage is more than enough, but this could definitely be something to consider. The 'Ask a Question' option could definitely not be removed as the user likely already came from Google, however changing the priority of the UI elements could get a lot of users into the search flow first rather than the ask a question flow. Additionally showing the Q&A info banner might not be necessary any more which would clean up the design a lot as well. New users will have consciously searched the site. It will not take a lot more work than the current Ask Question process, but it will be a two step process where instead of in a small box inside the form the similar questions are shown full size and the mental expectations of the user are different ("I am going to ask my question" vs "I am searching for an answer to my problem, maybe I will have to ask it myself"). For a lot of established programming languages all simple questions have been asked already. This is something I have been realizing more and more lately, but it is kind of true. Even for some of the more obscure languages. New users tend to have questions about popular languages rather than exotic libraries or languages, so improving the search experience should be more important than improving the ask a question and moderation processes on which a lot of time is spent. The current search engine is far from good (at least IMHO which is shared with other users directing new users to Google rather than SO search; some others (see below) disagree). It would either need rebuilding or, for example, one could try contacting Google about whether they'd like to support StackOverflow with 'Google Search for Enterprises'. This discussion is out of scope for this feature request/proposal and there are other questions discussing various aspects of the search engine and presentation. However even with the current engine and system a redesign like this could be extremely valuable. Changing the homepage only makes real sense for SE sites after they reach a certain amount of content, which is hard to define. SO definitely has enough content to make this a worthwhile change and the same is true for some of the other sites on the network. There are however also sites that will never reach this point, either because they strongly deviate from the SE formula (codereview.SE, codegolf.SE, puzzling.SE) or because the number of theoretical questions that can be asked on a topic is just too ridicilously big (e.g. patents.SE). Either way, this can be easily be determined by looking up what percentage of questions get closed as duplicates per site. The issue however is that implementing this would make SO (and possibly other sites) deviate from the rest of the SE sites. This could be seen as reaching the next level of maturity, but it will be on odds with the current homogeneity. So, yeah, just an idea I had, glad to see many in the community agree. I think this is a great idea, it should definitely be implemented. Giving greater dominance to searching rather than asking is such a simple solution; lower dupe count, more effort required, cleaner front page UI, etc. Overall I certainly agree, the site does need to be displayed differently. Personally I think the UI is a little too clean, maybe something like Wolfram Alpha's home page style could be used, with top questions (or tags) in the background instead? (Of course minimalism is the current UI trend. So this isn't an absolute "must-have", only a suggestion.) As David pointed out implementing this idea may lead users to slip back to the current Q/A flow, rather than encouraging them to search. I don't know that I support the entire homepage changing. That seems drastic. Doing this on the /ask page is more of a "Just In Time" solution. Let people freely browse on the homepage, click around and explore tags and questions, but once they get down to the brass tacks of asking, once they have indicated intent to ask … guide new users into search and so forth via a revamped /ask page. I like the idea of encouraging new users to search before posting. I also agree that most beginners questions have already been asked and answered. 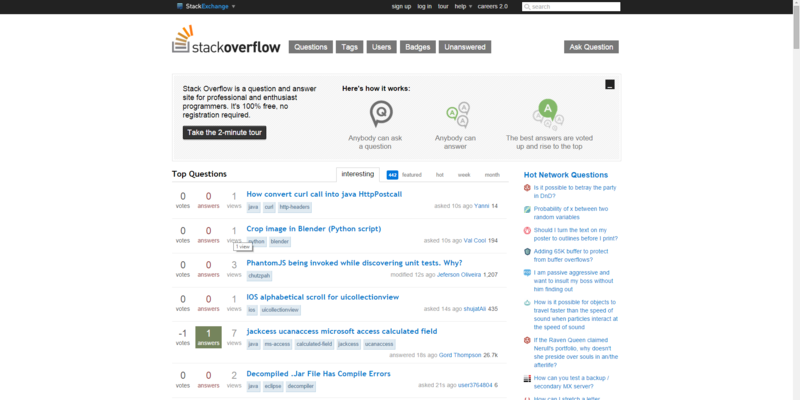 This community has already managed to build a great library of detailed questions and answers to most of basic programming related questions. I disagree with this view. Since I have learnt how to properly use the SO search box, I find it very useful, quick, and to the point (based on the actual search query). I takes me a lot less time and clicks to find exactly what I need by composing a detailed query than to go through a few pages via google search(even if they redirect to SO). It's not the same google as a few years ago, now everything is somehow filtered. I don't want to go into details about how google engine work here as it would be off-topic but in general I really honestly prefer to use the internal SO search box. I don't think it needs rebuilding at all. I think with a bit of more user-friendly help page we could really expose the power of the SO search engine to everyone (including new users as well as veterans who never bothered using the internal search box). Redirecting new users to the "HOW DO I SEARCH" once they click "ASK QUESTION" button would be worth giving a go. Say someone has already asked a question (or 2 or 5) and they have been well received by the community -> so that user doesn't get redirected to "HOW I SEARCH" and therefore is eligible of asking a new question directly. All other users should be encouraged to "SEARCH" before posting their (almost always already answered) question and I think most of the people here will agree with that. I don't know if the front page necessarily factors into the workflow of new users – the 'Ask Question' button is on every page, after all. Instead, I think making the Ask Question page better at finding solutions is the solution. Make the workflow start with choosing tags, to immediately highlight the most frequent questions. Consider the title as a search phrase, showing a search results page you need to click or scroll past before writing the question. Include Google-like blurbs, not just a flat title list. Not the answer you're looking for? Browse other questions tagged feature-request search homepage . Why are there so many bad questions? How can we encourage close voters to use their powers? 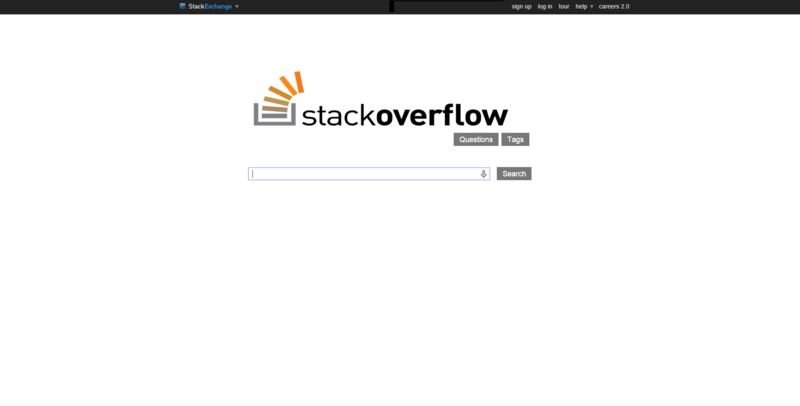 Move search to the top center of stackoverflow and all other sites?